Today the JOIDES Resolution reached the first drill site for Expedition 330 to the Louisville seamount trail. 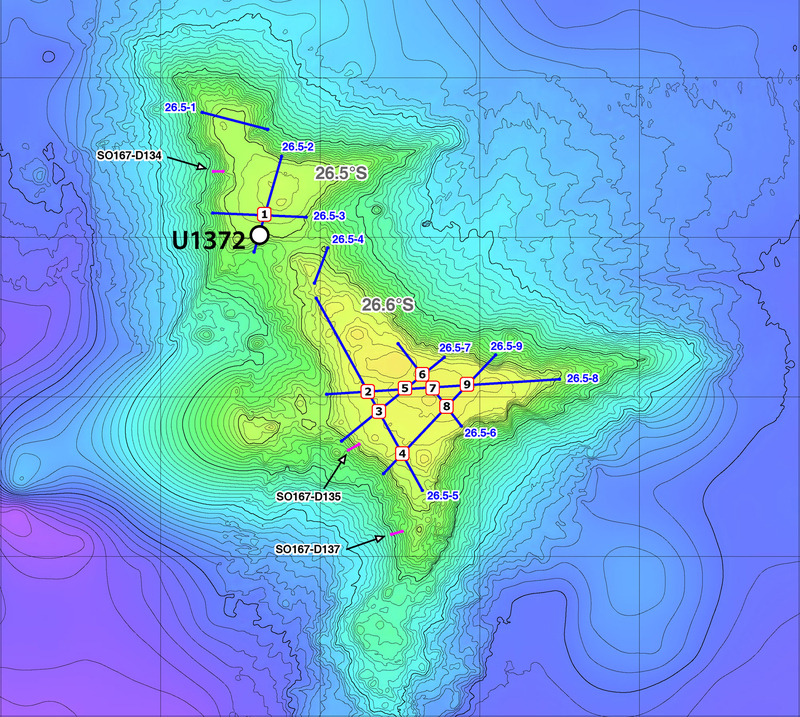 As by rule we continued counting drill sites from where the previous expedition to the "South Pacific Gyre" left if off. This means that our first drill site automatically gets assigned the number U1372. In other words, we are drilling the 1372nd site since the onset of ocean drilling in the 1960's, when the Integrated Ocean Drilling Program (IODP) was stilled named the Deep Sea Drilling Program (DSDP). Our 3.5 day transit took us from the port of Auckland to the north-northeast and crossing the deepest part of the Keramedac trench on our way. The weather has been favorable, although the 15-20 knot winds that we were taking in on the starboard bow were creating enough of a pitch and roll to make some of us onboard a bit "unconformtable." However, soon after our arrival at Site U1372 the wind calmed down considerably and the sun came out, excellent weather conditions for our drilling operations. During the transit all 30 scientists onboard were fully trained in their respective laboratories and informed about all their duties while on this expedition. This meant an endless series of meetings, a fire and abandon ship drill, and many sessions in the labs to get completely familiarized with equipment and laboratory protocols. Also, during our transit the science party was broken up into two 12-hour shifts. From now one everybody is going to be working either from midnight (00:00) to noon (12:00) or from noon to midnight! They will do that for the rest of the 8 week expedition and for 7 days per week, quite a heavy load of work! The two co-chiefs have their own opposite shifts from 2 to 2, while the expedition manager is on duty from 6 to 6, all in an effort to create an overlap with all scientists from both shifts, with each other and with all technicians sailing on this expedition.